Lowdown: A useless pirate is striving for infamy through scientific achievement. The first thing to note about The Pirates! Band of Misfits is that it’s an Aardman animation production coming from the people behind Wallace and Gromit and its likes (also the people behind the horribly wrong Wallace and Gromit exhibition currently running at Scienceworks). The second thing to note about The Pirates! Band of Misfits is that in all countries other than Australia and the USA the film is actually called The Pirates! In an Adventure with Scientists. Obviously, someone up there in studio kingdom thinks us Aussies and them Yanks too dumb to appreciate a film dealing with science. I have to say I don’t understand this name change: science (albeit in twisted form) is a central part of this film that’s based upon a book by the very same name. I will therefore refer to the movie from now on simply as The Pirates! 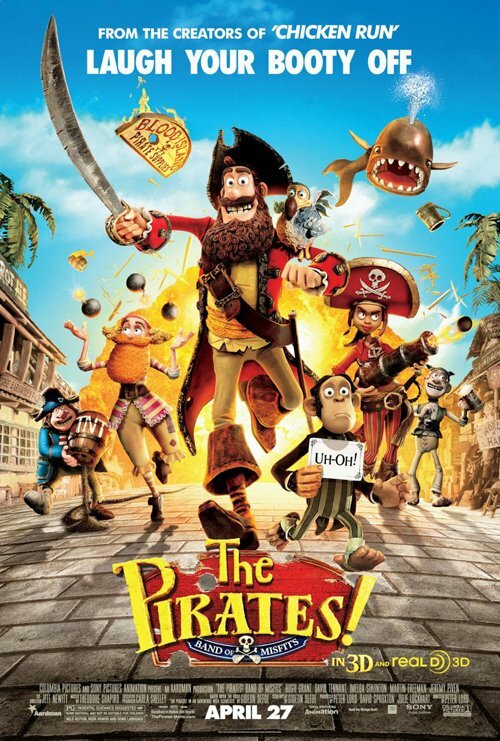 The story tells us in wonderfully rich animation of the escapades of The Pirate Captain (Hugh Grant), a lackluster pirate during the heydays of not online piracy who can’t pirate anything, has failed to achieve the title of Pirate of the Year for decades, but still aspires to beat the competition and gather the most loot to win the title with. Luckily for our friend here, he is accompanied by a loyal group of good hearted fellow pirates that’s voiced by the likes of Martin Freeman, Brendan Gleeson and an Ashley Jensen (of Extras fame) in the role of a female pirate wearing a thick false beard so that no one notices she’s not a man. In case you haven’t guessed by the cast yet, The Pirates! Is often cleverly funny even if it is far from being the most hilarious film of the year. Hope comes to the potential rescue of our Pirate Captain through Charles Darwin (David Tennant), with whom he bumps upon raiding his ship. Yes, we're talking about the Darwin (figured out why the movie title was replaced?). Darwin quickly figures out the pirate ship’s parrot is no parrot at all but rather a dodo, making it a rare and glorious scientific find. On his side, the Pirate Captain sees the dodo as his ticket to Pirate of the Year. And Queen Victoria, who loathes nothing more than pirates? She has other plans for our dodo. The Pirates! thus serves as fine entertainment for all ages. Children will like its characters, chases and slapstick; adults will appreciate the occasional witty remark (such as the one that brings the idea of evolution to the mind of Darwin). Me, I liked the film’s spirit the most: there is a definite feel of rebelling against authority coupled with doing things the non conventional way at hand here. Lest we forget, there is also ample healthy disrespect for the British monarchy. Put together, this means The Pirates! serves a fine example for kids to follow, much better than the stuff of conformism that’s usually thrown at them. The whole free enterprising spirit certainly goes well with the theme of piracy! Perhaps The Pirates! is not the deepest film ever. It is, however, a piece of fine entertainment. Best scene: The Pirate of the Year award ceremony, DJed by The Pirate King (Brian Blessed), serves adult viewers a fine parody of self-indulging award ceremonies. Overall: A fine film that’s significantly above the mediocre average of children movies. As a bonus, it works for adults too. 3 out of 5 stars.